Daniel is comparatively new to death row. He has less than two years under his belt, whereas many of the inmates on the row have been incarcerated at San Quenin for decades. As Daniel has become accustomed to his new surroundings, he has shared his experience with me along the way. I talk to Daniel Wozniak on the telephone regularly. We write each other often. I’ve even visited him at San Quentin a couple of times. I feel like I’ve learned a lot about how death row functions in the state of California. As you all know, I’m fascinated by this world behind bars, so when I came across a podcast produced entirely within the walls of the San Quentin State Prison, I was hooked right away. Ear Hustle is the project of Earlonne Woods and Nigel Poor, co-founded with Antwan Williams. Antwan and Earlonne are inmates, and Nigel is a visual artist who volunteers at the prison. That’s because death row is considered a completely separate prison within the prison. Daniel lives by much stricter rules and has a lot less freedom than the mainline prisoners. Ear Hustle recently released an episode called “The Row” focused entirely on San Quentin’s condemned unit and how it differs greatly from being incarcerated on the mainline. 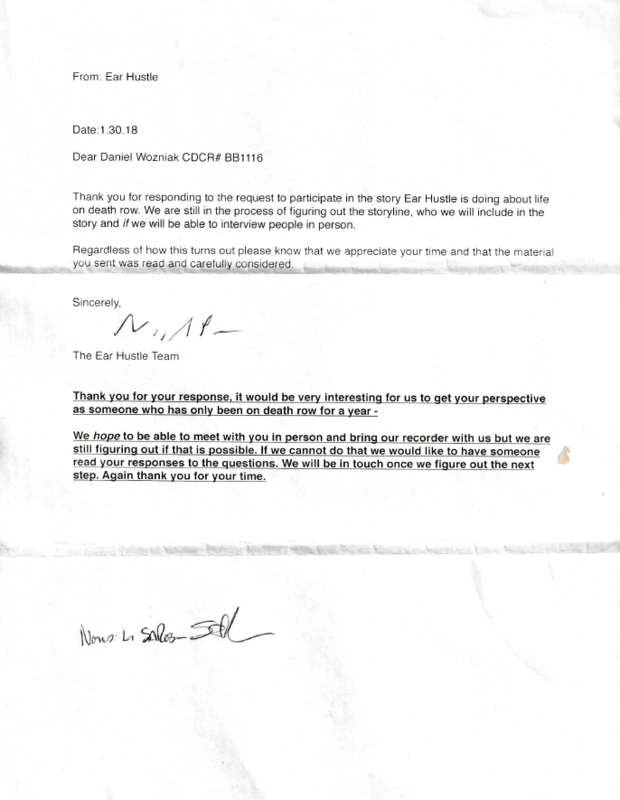 Earlonne and Nigel wrote a letter inviting death row inmates to contact Ear Hustle if any of them were willing to share their experiences. I’m not sure how many responses they received, but one of them was from my friend Daniel Wozniak. Daniel agreed to the podcast interview, but there was a major logistical issue. As death row is a separate prison, the inmates housed there are not permitted inside the media lab where Ear Hustle is recorded. Without ever leaving the grounds of San Quentin, Daniel could walk into another room and suddenly be outside the confines of his prison. Big no-no. As they said on the podcast, and I’ve heard Daniel say this regularly, a “workaround” needed to happen. The interviews would take place over the telephone. In Daniel’s case, he was brought into the East Block Custody Sergeant’s office for his interview, which took about ninety minutes. Daniel was asked about his life behind bars, his methods for coping with incarceration, and how he feels about his future. He did a good job. He’s grown up a lot since the Lock Up debacle of 2011. One of his statements did cause him a little bit of grief with some inmates. In his interview, Daniel spoke about not wanting to waste his life in spite of being behind bars. He mentioned how some inmates spend all day watching TV, and he personally didn’t want to live like that. Daniel didn’t mean for this to come off as judgmental of anyone, but a few guys took it that way. Some people were insulted. Apologies were made and all is well. And you don’t need to be an inmate to spend all day watching TV. Am I right? There were two other death row inmates interviewed for the episode. They had both been in San Quentin for decades. Unlike Daniel, these men had been around long enough to remember the last time an execution actually took place. They have experienced death on death row. 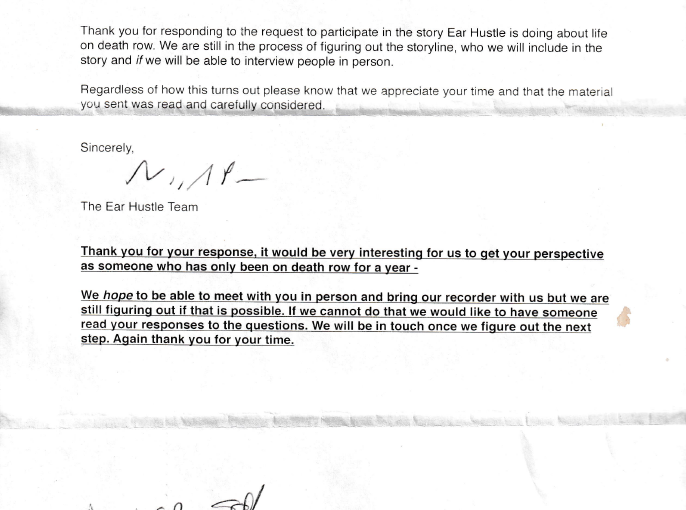 Ear Hustle interviewed some mainline inmates who were also around during the last execution in 2006. For me, the most enlightening part of the podcast was learning how some mainline inmates feel about the condemned men on the other side of the prison. But Earlonne Woods countered that line of reasoning by pointing out the many freedoms given to the mainline population as compared to the row. On the mainline, inmates can be out of their cells for most of the day. They can go to yard, they can spend time with their fellow inmates, and they have numerous classes and programs offered to them. Daniel told me that sometimes bands come and play outdoor concerts for the mainline population. Occasionally inmates will even get up onstage for a jam session. Daniel said there’s also an annual visit from the NBA Golden State Warriors basketball team, and they play a game against the San Quentin inmate team. Sometimes the inmates win. It appears there is some sadly wasted talent behind those walls. On the podcast, Nigel pointed out the “incredible disconnect,” between the death row and mainline populations. I knew about the separation, but I hadn’t realized that mainline inmates aren’t even allowed to speak to the death row inmates. Daniel insists he told me about this practice when he first got to San Quentin, but I don’t remember it at all. Maybe my dogs were loudly flipping out about a UPS delivery, and I couldn’t hear Daniel on the telephone. This happens a lot. Daniel says he told me all about the first time he was escorted across a yard. 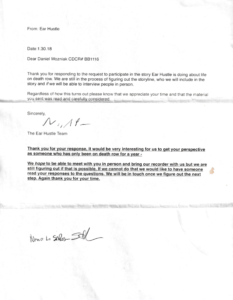 A mainline prisoner, who was likely new to the San Quentin population, approached Daniel and enthusiastically pointed out how he recognized him from the TV show Crime Watch Daily. Luckily for that guy, the baton-holding guard responded to the “threat” verbally, and not physically. I think I would have remembered that story. Earlonne Woods reminded the listeners that not everyone on death row is a serial killer, and there are plenty of convicted murderers on the mainline. A lot depends on the prosecutor, the jury and the police reports. “Some of the guys are here on the mainline for committing the same types of crimes that put other guys on death row,” Nigel pointed out. In his interview, Daniel talked about how he’s had people support him along the way, and how he’s been able to change from the man he was before his incarceration. Daniel feels as though that person is dead. The man responsible for the murders of Sam Herr and Julie Kibuishi is the one who was given the death penalty. Daniel is now becoming a new and better person. I like to think I’m one of the supportive people helping Daniel become a better person. Also, I’m torn by the idea of Daniel completely detaching himself from the murderer who lived inside him. I agree he isn’t that man anymore. But the heartbreak and destruction from Daniel’s past deeds are still very real to Sam and Julie’s loved ones. Daniel Wozniak’s redemption is likely of no concern to the Herr and Kibuishi families.